Several years ago, I was in Norway giving a presentation and using interactive Q&A for the first time in a conference. Previously, I had always used the microphone for my presentations. On this day, we had a new event technology that had a Q&A feature. I discovered very quickly that if everyone had a chance to ask questions they would do it. I received dozens of questions via the interactive Q&A app. Second, I learned that people were more willing to ask questions via the technology than stand up in front of the room with microphone. Finally, I quickly discovered that I could easily skip questions that I didn’t want to answer… or the questions that I thought were irrelevant. It was my first “aha!” moment with interactive Q&A technology. Since then, I have had a chance to work with lots and lots of marketers, leadership teams and event teams to help them structure interactive Q&A sessions in their events. Here are my best tips for planning and managing Interactive Q&A. Interactive Q&A can be as simple as – “hey post some questions via this app and we will answer them.” Or, you can make the process more involved. Here are five major considerations when planning Interactive Q&A. Will you allow attendees to post questions during the entire presentation or only at the end? This question gets at your preferences. As an attendee, I like to be able to ask questions when I think of them. I once had a question on slide 21 or a 97 slide deck. I nearly forgot my question by the end of the presentation. However, some event organizers prefer that attendees only ask questions during the specific Q&A period. When will the speaker address those attendee’s questions? So, it’s one thing to allow attendees to submit questions when they think of them – but how will your presenter handle the questions? Will your speakers answer questions as they arrive in the app, or only during the designated Q&A time? How will you pick the questions that get answered? Most likely, you are going to get more questions than you can address in the allotted time. So, you need to have a plan for selecting the questions that will get answered. Will the speaker or the moderator pick the questions? To reduce the burden on the speaker, many people use either a moderator or a subject mater expert to filter through the questions and present questions to the speaker. Will the questions be anonymous? It’s an important question. If you are dealing with sensitive subjects like facility closings and layoffs, then anonymous is best. How visible will the questions be to the audience? You could present the questions on the screen for all to see or they can be available on a tablet for the moderator or you can put them on a confidence monitor. Each event organizer and speaker have different preferences here. Can the technology support the experience that you want to create? You need to speak with your vendor to make sure that the technology has the flexibility and capabilities to support the experience that you want to create. In our audience response app for example, moderators can push questions to the screen from a tablet or queue a list of questions to answer on a tablet. How will attendees access the interactive Q&A app or audience response app? You need to know how the attendees will access the app. Is it a website that they access or will you use an app that they need to download and install? Whatever you do, please try to make it easy for the attendees. Then, be sure to give them proper instructions. Who will be responsible for coordinating the audience response app onsite? This technology is really easy to use, so you probably don’t need to fly in staff from the vendor. However, you do need to assign someone from your content team or the production team to support the technology. Do the attendees need internet or 3G/4G bandwidth to access the app? The answer is probably yes. So, make sure that attendees will have access to either a mobile signal or Wi-Fi in the event space where you are working. Otherwise it’s all for not. Prices vary. Sometimes this technology is available with an audience response app or an event app. Other times it is offered as a stand-alone technology. It’s important to run through everyone’s roles and responsibilities and the communication flow before each session. Most likely, your speaker will be responsible for the “call to action” to submit questions. It could be a verbal cue or a slide with instructions that is incorporated into the speaker’s slide deck. If you have a moderator, they will be responsible for sorting through the questions and picking the best questions for the speaker to answer. Make sure that your moderator has a tablet or technology that can access the questions submitted by your attendees. Make sure that the speaker and the moderator coordinate how they will manage questions before hand. The moderator should understand the topics and themes that the speaker wants to avoid. This will save everyone from embarrassment. To get off to a quick start, it’s helpful to have a few questions seeded in the system. The first questions prime the pump and help stimulate attendees thinking. In the mean time, the seeded questions allow you to start the Q&A while you wait for questions to come in. It usually takes about a few seconds for people to think about their question and type it in. If you can – celebrate the people who are asking questions. Your attendees like to be recognized as thoughtful and smart. 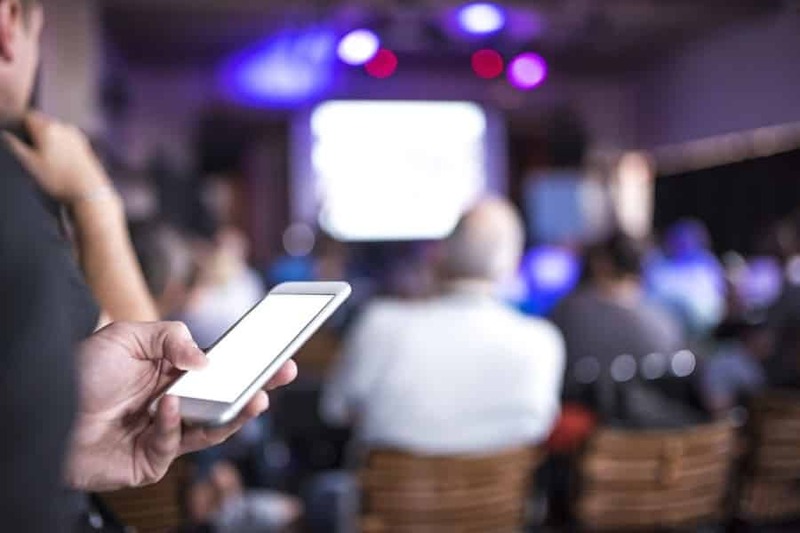 If you’d like to see how you can create more engaging and interactive presentations using our audience response app, feel free to contact us with questions or to discuss your event with one of SocialPoint’s Digital Strategists. We’ll help you generate greater attendee engagement at your events.